Reinforcement is critical to the success of all initiatives because people have a natural tendency to revert back to what they know and are comfortable with. Did you develop plans for reinforcement and sustainment activities? What reinforcement tactics were used? Did you allocate resources for reinforcement activities? How do you deal with the issue of reinforcing and sustaining change when it occurs after the project closes? Who was responsible for making sure reinforcement and sustainment activities were carried out? How did you use performance appraisals and measures to encourage adoption? 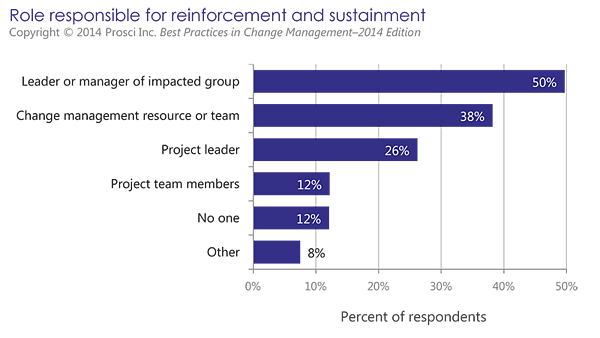 Participants in the 2013 benchmarking study were asked if reinforcement and sustainment activities were planned for as part of their projects. Sixty-one percent of participants planned for these activities. Those who planned for reinforcement and sustainment reported greater success rates on their projects. 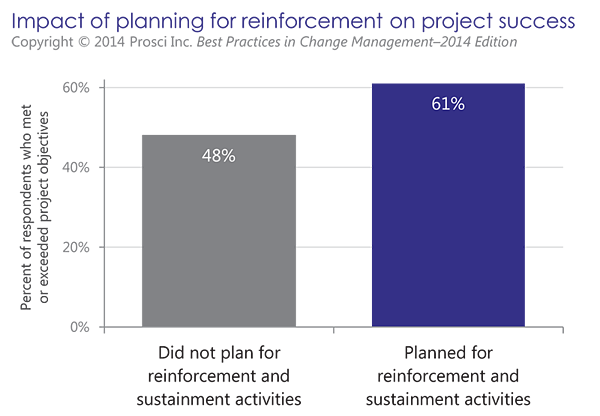 The figure below shows that 61% of participants who planned for reinforcement or sustainment activities met or exceeded project objectives, compared to only 48% of participants that did not plan for reinforcement. Participants were also asked if project resources were allocated to the reinforcement and sustainment activities. Only 44% reported that resources were allocated to this effort. 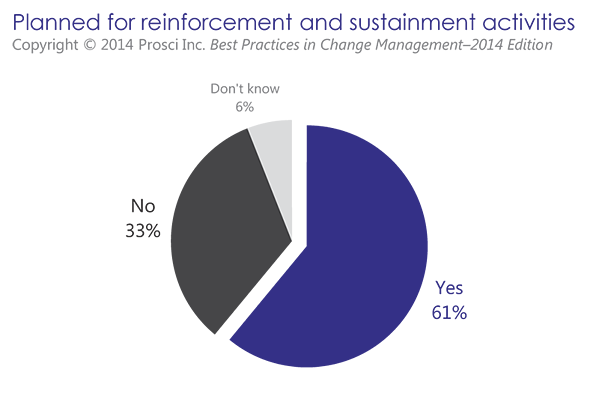 Participants who allocated resources to reinforcement and sustainment activities reported greater success rates on their projects. 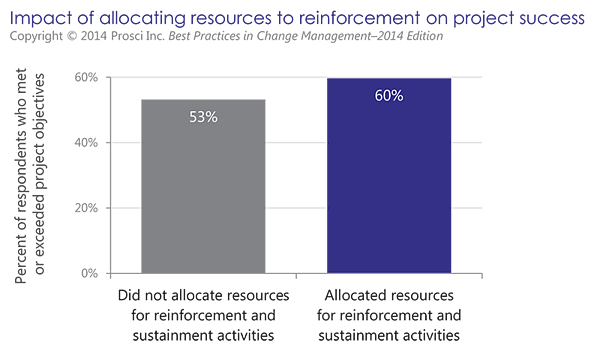 The figure below shows that 60% of participants who allocated resources to reinforcement and sustainment activities met or exceeded project objectives, compared to 53% of those who did not allocate resources to reinforcement. Participants in the 2013 study identified who was responsible for the reinforcement and sustainment activities on their change initiative. Nearly half of participants said it was the leader or manager of the given impacted group. Just less than 40% reported that the change management resource or team was responsible for this effort. Participants were able to select multiple roles, resulting in a total of more than 100%. From a change management perspective, reinforcement can be difficult because once a change is finished, we are often moving straight onto the next change. It takes concerted effort and time to make sure a change "sticks," and given the scarce resources and change saturation that many organizations face, reinforcement efforts can often fall short. We see this scenario playing out in the data. 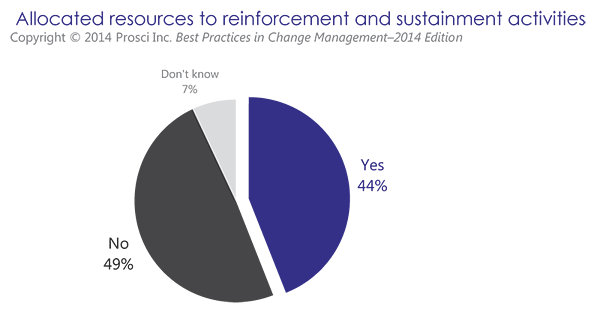 A little more than half of organizations are planning for reinforcement and sustainment activities, but fewer than half are dedicating resources to this effort. 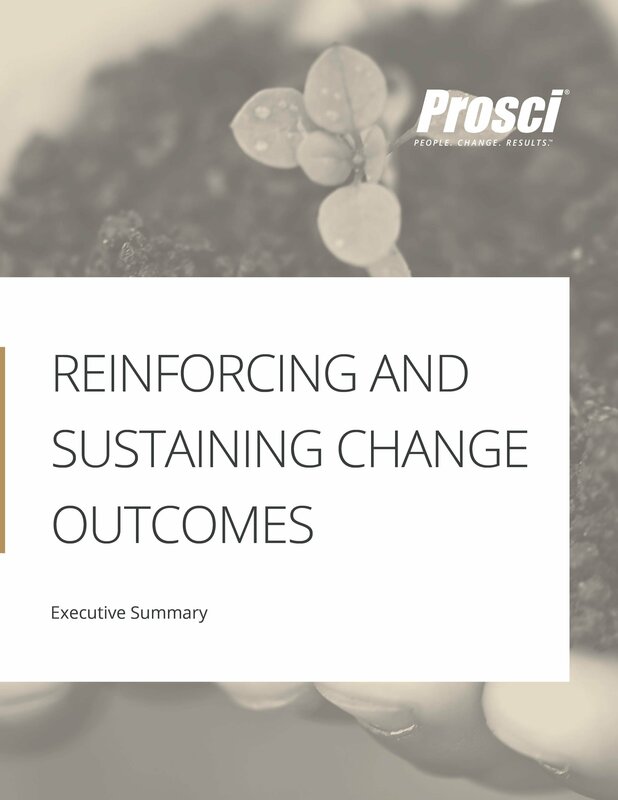 The data is clear: organizations that are planning and resourcing for reinforcement are more likely to meet or exceed project objectives than organizations that neglect this critical step in the change process. Making change stick is vital to realize the desired benefits of a change. Sustaining change is the last and most crucial step to successful change management. This in-depth research study adds to existing research and methodology aimed at reinforcement. Download the executive summary for a sample of the insights and lessons learned.